Mash Tun - Build Your Own!!! The first piece of equipment you'll need (or want) before going all-grain is a mash tun. Recently, a lot of people have been using the Brew in a Bag (BIAB) method, but that requires something to lift a heavy grain bag out of your kettle (ladder & pully system), and you also typically get lower efficiency out of these systems. For my money, the good old mash tun is the way to go. Mine is pretty easy to build. 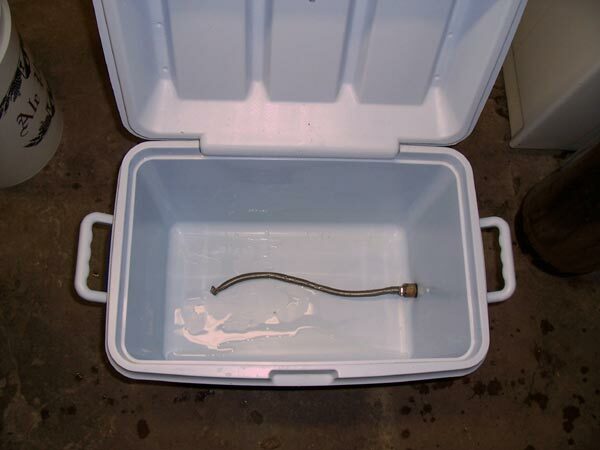 All you need is a cooler with a drain spigot, a ball valve with a 1/2" barb, threaded 1/2" tubing (length will depend on your specific cooler, 1/2" barb for the inside of the cooler to attach the mash filter, and a toilet supply hose w/ metal mesh to act as a filter. The AHA has a good bit of information on batch sparging and building a cooler mash tun HERE. After you cut the ends off the toilet supply line, you remove the inner plastic tubing and you're left with something that resembles a Chinese finger trap. This fine metal braid acts as a filter for the grain when you're draining and sparging your grains. I've tried commercial products like the Bazooka Tube and Bazooka-T, but I've always gone back to the toilet supply braid after having runoff issues. 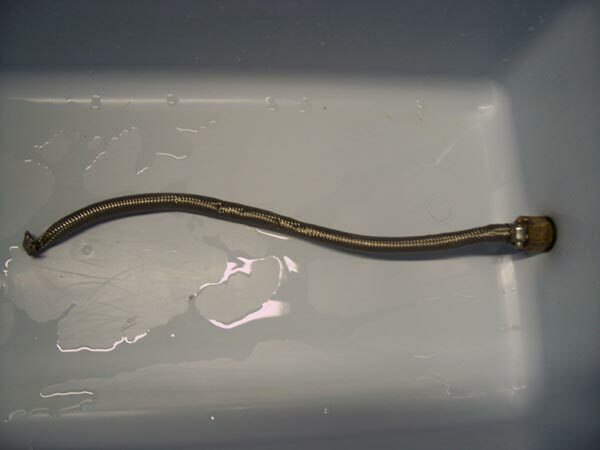 Just attach the braid to your 1/2" barb with a hose clamp and then fold the end of the braid over onto itself several times with a pair of pliers. Since you'll be collecting enough wort for a 5-gallon batch of beer + your boil off volume (usually 1-1.5 gallons), you'll probably need to get a larger kettle than you've been using for extract or partial-mash. Around the holidays, you can usually find some burner & pot turkey fryer deals, but they may not be the best quality. I would suggest the burner (I have 2) and kettle below. While you can use an aluminum pot for brewing, stainless steel will always be better. 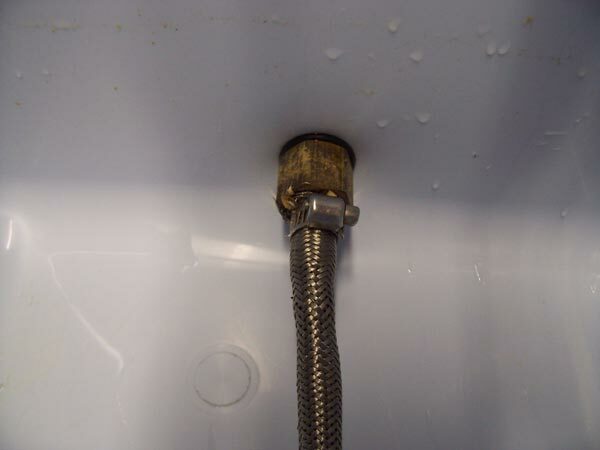 You may also need to buy a slightly larger pot to heat your sparge water. If you have a 5 gallon pot that was used for extract, that should be big enough. If not, find a cheap 5-6 gallon pot to use for sparge water or check out the one below. Since you'll be boiling the full volume of wort for your 5-gallon batch of beer, you'll need a way to cool down that larger volume of liquid more efficiently. A copper immersion chiller is perfect for 5-gallon batches and will last you basically forever. You could potentially get away with using a water bath, ice cubes, and stirring, but this method will cool your wort down to pitching temperatures within 20-30 minutes typically, depending on your ground water temperature. Refractometer - This device can easily measure the specific gravity (SG) of your wort with only using a few drops. It will automatically correct for temperature, so you don't have to wait for a hydrometer sample to cool down. It's really an invaluable tool for AG brewing, especially when you're new to the process and trying to make your system more efficiently and predictable. When I first built my system, I would take a reading of my first runnings, my second runnings, and the combined total wort volume. This allowed me to tweak the crush of my grain, how much water I was mashing with vs. staprging with, and dial in the repeatibility of my system by considering elements like total grain weight and expected SG. Grain Mill - You can usually get your grains crushed from your local homebrew store (LHBS) or online vendors, but gap of their mill and the crush you get may not be ideal for all-grain brewing. To have total control over your beer, I would highly recommend you purchase a grain mill. This will also allow you to buy grain in bulk and crush it when needed. This will ensure you're grain is as fresh as possible. After grain is crushed, it's more susceptible to oxidization and staling. After wearing out my Barley Crusher after a few years of heavy brewing, I upgraded to a Monster Mill MM2 and have been very happy with it. The initial investment is a bit higher on this mill, so I've also included a link below to a less expensive mill that should work well for most brewers. I start with hot water from the sink, add ½ a campden tablet to the mash water to remove chlorine and chloramines, and then turn on my burner. While the mash water is heating up, I weigh and crush my grains. Once my grain is crushed, I dump my mash water into my cooler mash tun. Dump the grains slowly into the mash water while stirring with a mash paddle. Be sure not to get any dough balls. Let the mash sit for 30-60 minutes. When the mash has about 20 minutes left, I’ll measure out my sparge water, add the other ½ of the campden tablet, and then start heating that in my kettle. I scoop out the water with a pitcher and add it to my mash. After stirring the mash, I open the valve on my mash tun about half-way and pull off a couple quarts until there are no chunks of grain coming through. When the wort comes to a boil, I add the bittering hops and start my timer. When there’s about 15 minutes left in the boil, I add my immersion chiller to the boiling wort to sanitize it. I also add Irish moss at this point. Once I’m finished with my 60 minute boil, I haul my kettle down to the basement and use my laundry sink faucet to run cold water through the chiller. While the batch is chilling, sanitize your fermenter and anything that will come in contact with the cooled wort. Dump the chilled wort into the fermenter to aerate it, and pitch your yeast.